I Just Got Home and You Want to Know if I Want to Go Back to Camp? As an adult, sometimes it is hard to remember the feelings that you had leaving home to go to camp, or even college for that matter. Do you remember what it felt like to once again sleep in your own bed or get something from the refrigerator whenever you wanted? Campers returning home after the summer enjoy the comforts of home and, of course, the individual attention of family showering them with love and affection. The idea of leaving the happy cocoon of home can be almost unfathomable to any child, especially those who recently finished their first summer at camp, or are planning on going to camp for the first time next summer. They are flooded with a mix of emotions about home and camp that are not only hard to identify, but also hard to resolve. This reaction, especially from first-year campers, is incredibly normal and more common than most people realize. However, it does confuse parents tremendously, and can create conflicted emotions about camp for the entire family. Asking a young child, who may have had a tough adjustment to camp, and/or experienced homesickness during the summer, if they want to leave home again after being home for a relatively short time, can be difficult. When you factor in that they have also had to adjust to everything that comes with starting a new school year, while reconnecting friends from home, the question becomes even more daunting to the child. It is hard enough for them to predict how they will feel a week from now, much less nine months from now. For many children, there can also a psychological or subconscious impact if they expressed “homesickness” over the summer, and they are afraid of losing face. There can also be a feeling that if they say that they want to go back to camp, it is somehow a rejection of their parents because they’re choosing camp over home. Even as adults, trying to sort out and accept multiple emotions at the same time is a difficult task, but for a child, it is like climbing Mount Everest. So what is a parent to do? If you know that your child had a great summer at camp, and you can see the positive growth your child experienced at camp, have confidence in your personal assessment. Remind yourself that your child’s reaction is totally normal, and that there are understandable reasons why they have inexplicably changed their tune about camp. Keep in mind that the start of camp is still nine months away. In addition to your child going through nearly a year of growth and maturity, home will not feel as “shiny and new” as it does right now. If you feel confident that your child should, and ultimately will want to, return to camp, then you should re-enroll them. After all, you have the ability to see the bigger picture far more clearly then your child can. Make sure that you express your confidence about them going to camp, loving it and being successful. It also helps to remind them that they will be a veteran at camp, and everything will feel much easier because they did already had a successful summer (or two). At this point, children can go in one of two ways. Some will want you to help talk them through their positive camp memories, and will want to be reminded of the fun that they had there. Others will want to put off talking about camp for a while, and allow themselves to live in the moment of school and home life. Both of these approaches are totally fine. Follow your child’s lead on camp discussions, but remember, if they are giving you concerns about camp, it is best to validate those concerns and help remind them of the positives they may not be thinking about at this point in time. 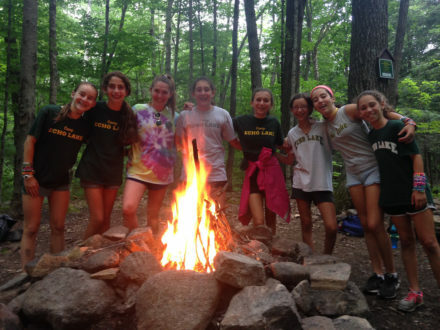 Schedule playdates, sleepovers, and get-togethers with their camp friends. Bring them to the winter reunions in December, and the winter weekend in March. Look through the summer website photos with them and ask them to describe what they are having so much fun doing in the photos. Encourage your child to read the Trail newsletters throughout the year, the Trail Yearbook that they get in December, and even to write about a fun camp memory for the Camp Echo Lake blog. Ask them to sing you their camp songs and cheers, or teach them to younger siblings. Show them the happy letters they sent you from camp. Create positive associations with camp. For some children this can be done immediately, and for others it may be best to wait until after the new year or the spring. Remind them that nothing exciting – certainly not as exciting as camp – is going on at home, so they would be bored if they stayed home for the summer. Finally, please don’t hesitate to call or e-mail Tony Stein or me (it is my pleasure to do this anytime of the year) to schedule a home visit, video chat or email exchange so that your camper can reconnect with a trusted adult at camp, and make sure they feel heard, understood and taken care of. We can also help remind your child of all the fun they had at camp, and become another positive association. By the time June rolls around, and the weather is warming up, and you need to start packing your child’s camp duffels, they will be so ready and excited for camp, they will ask you to send them immediately! And, yes, you will (some time in the future), laugh with your child about the conflicted yo-yo feelings that they had about camp – probably when they get off the bus at the end of next summer, crying, because they are campsick again!